""After the first space ship reaches the moon," @nytimes wrote in 1960, "some intrepid explorer will, presumably, step out of his rocket to have a look around." 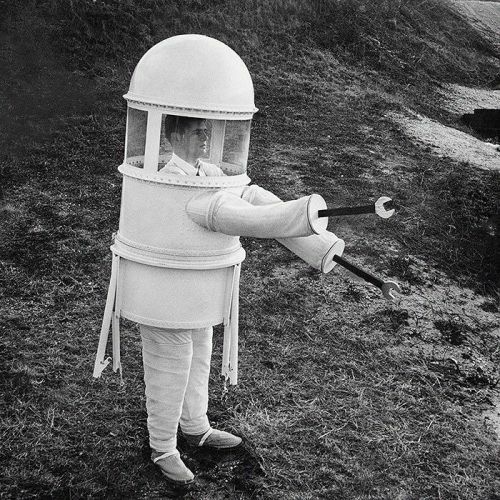 But what on earth should the well-dressed man (or woman) wear on the moon? The answer to the question appeared in a 1960 photo spread in @nytimes, with photos by the staff photographer Sam Falk. The suit, built that year by the Republic Aviation Corporation, would be fitting for a "stroll over the airless moonscape," The Times reported. The wrench arms were presumably to be used for securing loose screws, or "perhaps for repairs to his rocket before blasting earthward." #moonsuit #tbt #🚀" By nytimes on Instagram.